What a send-off it was for my hero, friend and the legend that truly was Cyrille Regis. His memorial service at The Hawthorns began with a beautiful rendition of Bring Him Home from Les Miserables by Chris Love. As his biographer, I was fortunate to gain a unique and personal insight into a man who was much more than mere footballer and someone of immense compassion and belief. Cyrille, like his parents Robert and Mathilda, had unshakeable faith. How else do you explain their brave decision to leave a wooden shack in the village of Maripasoula in French Guiana to seek a new life in England? Unspeakably difficult at times, with the family of seven split in five different directions at one point – a result of London’s lack of post-war housing stock – most would have given up and gone home. Not the Regis family. They believed. They had faith in their destiny and the fortitude to make it work. They succeeded. They carved out a better life. Cyrille was eternally grateful for the sacrifice his parents made – and strove to make the most of it. ‘By changing football, he changed the country’ ran one headline after Cyrille’s death. 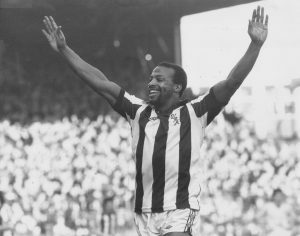 A pioneering black British footballer, Cyrille was exciting to watch but more notable for overcoming the unprecedented racism hurled his way alongside fellow black West Brom players Brendan Batson and Laurie Cunningham (dubbed ‘the Three Degrees’) to inspire generations of footballers (black AND white). Brave, strong and unflinching, Cyrille often told me the best way to respond to taunts is to turn a negative into a positive and fight back with your talent. As a mentor later in life he’d add to this: ‘Talent will get you there, character will keep you there.” Cyrille had bundles of character. Unsung heroes offered helping hands along Cyrille’s path to success. He never forgot them, including like the genial John Sullivan, who spotted him playing on Regents Park and took Cyrille to non-League Molesey FC. 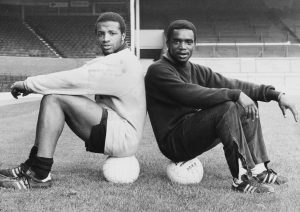 After progressing to Hayes and onto First Division West Brom, Cyrille lodged with Murtella Groce – or ‘Sis’ as she was known – who kept a home-from-home for the burgeoning star. Cyrille adored her immeasurably and later in life when in she was in ill health he’d visit her in a care home each week and they would sing hymns together. It wasn’t all plane sailing. 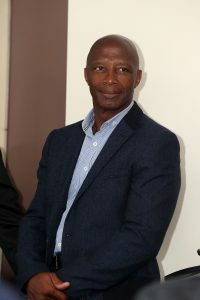 Cyrille lost his way mid-career – which made becoming an FA Cup winner in 1987 with Coventry City all the more sweeter. “You find out who you really are when things go wrong not when all is well,” he said. The loss of his good friend and colleague Laurie Cunningham at the age of just 33 forced Cyrille to reassess his life and he became a born-again Christian. Initially as a coach and later as a football agent, he became a wise mentor. His words mattered more than most and he shared that rare gift – doing things for people without fear or favour. His memorial service was attended by thousands of adoring people – and received unprecedented media coverage for a footballer. Cyrille Regis was truly loved for the man he was, not just the footballer he’d once been. He leaves an amazing legacy – sporting prowess matched by true character, gentle nature and a heart of gold. “100%,” “Every day of the week,” “For real.” I loved his positivity, winning smile and wicked sense of humour. He’d always ask after my family first and never considered himself important. 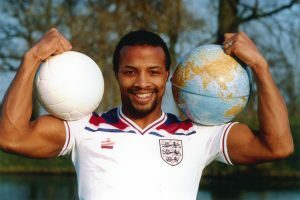 There really was only one Cyrille Regis. Without measure, he was one of the best men I ever knew. Someone I am proud to say became a good friend and, like so many others, I was far richer for the experience of having known him. Goodnight my friend, sleep tight. Chris Green is the co-author of Cyrille Regis – My Story, published by Andre Deutsch.